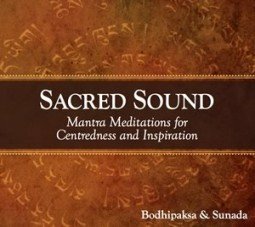 Sacred Sound: Mantra Meditations for Centeredness and Inspiration is available as an MP3 download from our online store. Om is a mystical syllable (see Om Shanti Shanti Shanti for more details). There’s more material on Manjushri below. See the links below the pronunciation guide for other pages. The final ḥ in dhīḥ has the effect of producing an echo sound. So the syllable is pronounced dhī-hī. Manjushri is a Bodhisattva who represents wisdom. Along with Avalokiteshvara and Vajrapani, he is one of a trinity of family protectors. The family that Manjushri protects is known as the Tathagata family, which includes the historical Buddha, Shakyamuni, as well as Vairochana, the central figure in the Five Buddha Mandala. “Tathagata,” the name of Manjushri’s family, means “The one thus gone [to Nirvana]” or (because of the ambiguities in Sanskrit) “The one thus come [to this world]” and is an epithet of the historical Buddha. Of all the Bodhisattvas, Manjushri has perhaps the closest association with the Buddha, and could be said to represent his genius (in the sense of his attendant deity) or daimon (attending spirit or inspiring force). Manjushri is depicted as a beautiful young prince, usually said to be sixteen years old. His freshness and beauty represent the fresh way that the awakened mind sees the world. While the unelightened mind typically sees life as being ordinary, to those who are awakened life is magic, extraordinary, and full of potential. Like most Bodhisattva figures, he is seated on a lotus flower. Because the lotus grows from mud in often foul water, and yet remains unstained, it is considered to represent the purity of wisdom, which can exist in the midst of delusion without being affected by it. Manjushri’s most distinctive emblem is the flaming sword that he holds aloft in his right hand. The sword symbolizes his mind’s ability to cut through the fetters that bind beings to the cycle of delusion and suffering. The flames suggest that the sword is not a literal one, and flames in Buddhist iconography invariably represent transformation; Manjughosa’s wisdom does not destroy ignorance in the conventional sense, but transforms it into Wisdom. In Manjushri’s left hand is his other characteristic emblem: the stem of a lotus, which bears a book. This book is the Perfection of Wisdom, which is both the source of his realization and a concrete symbol of it. In the Manjughosa form the book is held to the heart. There are numerous other variations of Manjushri, some of which go by different names. For example he is sometimes seen riding a lion, or holding a bow and arrow. Manjushri features prominently in many Perfection of Wisdom texts. He makes a late appearance in the Lotus Sutra, and is particularly prominent in the Vimalakirti Nirdesa. Both of these are early Mahayana sutras. However he is most often found in the later Perfection of Wisdom Sutras, where he is, in effect, the Buddha’s spokesman. In some of these sutras, the dialogues that Manjushri has with the Buddha are so intimate that we can get a sense that we are hearing the Buddha thinking out loud. Manjushri is associated with ordinary intelligence and mental accuity as well as transcendent Wisdom, and his mantra Om A Ra Pa Ca Na Dhih is said to confer intelligence. Shantideva, the author of the great Bodhicaryavatara (“Guide to the Bodhisattva’s Way of Life”) is said to have gained his wisdom by communing with Manjushri by night, while appearing by day as a slovenly and lazy scholar-monk. Being a musician, Pancashikha is also “gentle voiced” and is praised by the Buddha for the quality of his singing. Both figures are also involved in question-and-answer sessions with the Buddha, and both are generally depicted as eternally young, although this is so common a quality that it’s not in itself persuasive. Manjushri is often known as Kumarabhuta (“Youthful Being”), although he does also manifest in some texts as an elderly man. His quality of having eternal youth (sometimes despite appearances to the contrary) symbolizes the eternal freshness and spontaneity with which the enlightened mind approaches life. Funny. I see this mantra as more packed with conceptual meaning than any other. The letters may be associated with the Avatamsaka Sutra, but the I think the locus Classicus is the Large Perfection of Wisdom Sutra where each letter of the Gandhari alphabet (which is in the order a ra pa ca na etc) is associated with a quality of emptiness – a = anutpana, ra = rajas, pa = paramartha etc. The mantra includes the first five of these 44 letters. The alphabet in the LPWS is clearly intended as a series of meditative reflections on emptiness. There are earlier versions – especially from the Bajaur collection of texts dug up in Swat in 1999 dating from the 1st century CE, but also in the Lalitavistara Sutra (where two versions exist, one using the Sanskrit alphabet, and one using the more familiar Gandhari). Going forward in time the alphabet does occur in the Gandhavyuha (a chapter of the Avatamsaka) but the letters are not linked to a concept starting with that letter anymore. The main line of development seems to be into the Mahavairocana Tantra where it features a number of times. In the Sarvatathagatatattvasamgraha Tantra it is reduced to the letter a – probably the Sutra in one letter derives from this. Versions appear in the Hevajra Tantra as well although the focus is very different. The first line of the verse from the Large Perfection of Wisdom Sutra has been encapsulated in seed syllables and become a mantra in its own right. Om does leave the intellect hanging, but dhii.h is the nominative form of the dhii which means wise, visionary, intelligent etc. Welcome, Jayarava! For those who don’t know, Jayarava is an expert on mantras who runs an amazing site called Visible Mantra. I’ve been planning for ages to link each of the articles here to his site. Anyway I meant by “no conceptual meaning” was just that you can’t read the mantra as a sentence. Sohcahtoa, for example, doesn’t have a conceptual meaning in itself, but it does help to encode the main trigonometric functions. A Ra Pa Ca Na, from what you say, seems to work in a similar, acrostic-like manner, which is very interesting. I didn’t know about that, and I’m grateful for your injection of expertise. I’ve amended the article a little to take account of your comments. DHI you yo nah Prachodayat! Dhi here is intelligence, intellect,vision,drishti etc. DHI therefore is very important since early vedic times. However, in Tibetan Vajrayana it receives an added emphasis. Many Tibetan yogis meditate and even recite this seed Sound for months at a time.It is said to confer good memory, wisdom, intelligence, power of study and concentration and intellectual brilliance.The exact method (complete with breathing excercises) must be learned from a competent Guru. Thank you for this. I am a practising tibetan Buddhist with the Dechen School and I was given the spiritual name of ‘Banner of Manjushri’ on my taking refuge. I really needed to know exactly how the Manushri mantra sounded as I need to build a spiritual bridge to draw me out of negative mental effluvia. I am practing of manjushri sadhana last 2 years. right now i am happy with this sadhana. I noticed on ‘visible mantra’ Mipham adds a hung after D’hii. Having The 5th Dodrupchen: Jigmed Longyang as my Mater, I asked my dharma brothers about ‘our’ Manjushri Mantra and here’s what I got. Om A Ra Ba Za Na De I was kind of shocked at how different it appears, but seeing as it is coming from Master, I have proceeded with it. Yet, The 4th Dodrupchen made some 2 VCD’s on The Tibetan Language. At the end of the 2nd one he closes with this very same manta almost. As I hear him say it, it goes: Om A Dra Ba Za Na Da. Yet I just can’t help but tack a D’hii Hung on the end of it. And with Guru Rinpoche’s admonition for us to begin small mantra’s with Om Ah Aum…then here’s what I’ve come up with out of all this emptiness: Om Ah Aum A Dra Ba Za Na Da D’hii Hung Now I know you’re big on Ghandarvi and Sanskrit, but what about Tibetan? Dorupchen is nestled in a valley just over the Sichuan Provence line in Xin Hai about Serta University. I’m tempted to see about the courses there in Tibetan and Mantrayana. Doubt if there’s much at all of English. I’m afraid I know nothing at all about Tibetan. Not much about Sanskrit either, actually, but since I studied Pali and the two languages are similar I can just about muddle through. There are these errors creep into transliterations of mantras and dharanis, and there are pronunciation problems as well, but generally the rule seems to be that you stick with your tradition and not change things without the teacher’s permission. In the FWBO we inherited a slightly corrupt version of the Vajrasattva mantra which came through one of Sangharakshita’s teachers. We did change the mantra to the correct form, but only after consultation with Sangharakshita himself, out of the need to preserve unity and harmony. So you might want to talk to Jigmed Longyang, if he’s still your teacher. Will do. Yes, LongYang is still my Master. His teachers are Thupten Trinle Palzang [now known as Rinpoche], Rigdzin Tenpe Nyima, and Khenchen Jigme Phuntsok. Hopefully this next week, both Master and Rinpoche will both be in Chengdu and I’ll check with both of them together just to get it straight. Master didn’t give me the mantra himself. Two of his disciples did. So I really want to verify the exact pronounciation as you might expect. Hmm. Is there some manner in which I can upload the 2 VCD’s of Rinpoche teaching Tibetan to you? Or would that be an overload for you? Say, I’m sent to wondering…WILDmind versus TRADITIONALmind…I know dualities are illusions, but practical in this saha world…kind of like a cup is a cup, but it is not a cup, yet we call it a cup for expedience sake. Like a vajra is a dorje is a lightening bolt yet perfectly still and quiet…. Got the verification: A RA BA ZA NA DE [duh]. I still like beginning with OM A Aum and ending with D’HII HUNG [Hum] though. With Nyingma’s originator being Padmasambhava and finding in Dakini Teachings his request to begin short mantras with OM A AUM, it seems to ‘me’ to be the way to begin short mantras. And having so much info about D’HII as Manjusri’s seed syllable, it again seems to ‘me’ D’HII has to be sounded. And with a little study of Mipham and his amazing focus for ‘help’ with Manjusri, his placing of HUNG at the end again seems right to ‘me’. This ‘me’ feels it’s OK to go this way. thax you and i pray these things help someone who believes in it and not those who would think it as a mere waste…. thax again for teaching…….. annd let me understand and realise what it is for…..
Can you let me know your sources please? Which scholars/books? Which Pali text? The 2 forms are the wrong way round. It’s Manjughosa that holds the PoW to his heart and Manjushri who holds the lotus. Thanks for the correction on the iconography. I’m always mixing those guys up. Great stuff. Ah, ‘Youth’ the elixir for old geezars. In Conze’s version of the 700 lines at one point Manjusri mentions he is The Crown Prince. I wish he’d gone deeper into it, so in my own reflections it dawns on me: The crown of our head. Manjusri mentions a lot of non’s: non-production, un or non-thinkable, and non-existence to say the least. On non-existence it comes to me that existence is a weird word with is surrounded by an ex and a tence or tense. Isn’t it strange how Descartes starts off Modern Philosophy with I think therefore I am. To me Manjusri is suggesting Descartes has got it backwards. If thinking is who you are in an ego sense, then pre-thought is who you really are. Thinking requires tension. We leave the ‘relaxed’ state of being just to think be it images, ideas, or any form of ‘self’ consciousness. Manjusri suggests the Unthinkable Concentration. It is not unaware. And The Tathagata follows his suggestion with one of his own which seems very similar wherein one just sits quietly and waits silently for the name of a Buddha to be stated to you; then turn in His direction and listen to veritably an infinity of Dharmas to be expounded. Here in Chengdu is The WenShu Monastery, or The Manjusri Monastery. The back building is The Manjusri Pavillion wherein is the library on the second floor and on the third floor is where you can find the Manjusri Statue with 4 arms. His lower right hand holds an arrow [knowledge], his upper right hand the sword of wisdom of course, his upper right hand the bow of compassion, and all of these 3 hands are extended while his fourth hand is at his heart with The Prajnaparamita on its palm. Circumambulating Manjusri is quite easily done here with few visitors usually. His lotus seat is held up at points by vajras. A third definition of vajra is emptiness. When Manjusri informs The Tathagata that this Perfection of Wisdom is becoming clearer and clearer to me, The Tathagata says to Manjusri, “May it become quite clear to you Manjusri”. Just this saying by The Tathagata is a marvelous blessing and with it so we are all blessed for Manjusri is within us all along with The Tathagata. Some depict Saraswati as the consort of Manjusri. She is the goddess of beautiful voice. Although putting the truth into words, putting the Dharma into works is beyond possibility it is possible to beautifully voice words symbolically pointing in the direction of The Truth. Of course it all depends on ‘who’ is listening and hearing. In non-produced non-existent isolatedness the sounds of truth’s presence flows on and on syllable after syllable. Can you please help me find the Name and the Mantra of Lord Brahma i tibetan? Sorry, Yoshiaki, but I didn’t even know there was a mantra for Brahma, and I don’t know any Tibetan! But perhaps someone else here has a lead for you. Hey Bodhipaksa, What about the Manjusri Nama Samgiti? Hi, Mondo. It’s a lovely text. I don’t really have anything more to say about it at the moment, though, because right now I’m heavily focusing on the Pali texts and on exploring jhana. Jhana (Pali) or dhyana (Sanskrit). I mean the four jhanas, as opposed to meditation generally. I’ve been exploring a streamlined approach to getting into jhana, and I want to become more adept at moving up and down the four jhanas. At the moment it’s a bit hit or miss. I’ve also been doing some investigation into the extent that Nibbana, in the Pali canon, is portrayed as an escape from an endless round of rebirth (as far as I can see, it isn’t) and pondering why it’s so rare to see samsara and nibbana juxtaposed in the Pali canon. OK. I’ll catch back up with you after the move. Good luck…maybe you need Green Tara to expedite your move. Could you get a translation of this for us? I’m sorry Ricardo, but I don’t really have the time to take that on. You might want to make contact with Jayarava at visiblemantra.org. He’s a Sanskrit scholar and he’s also, as you might have guessed, very interested in mantra and dharani. Hey Bodhipaksa! I’m wondering: what’s the traditional time length for this mantra? I’ve read that as little as fifteen minutes a day can greatly improve concentration, memory, etc., but something tells me traditional approaches might favor a longer recitation. Mantras are often done as part of a visualization practice, which might go on for 40 minutes to an hour. But done in isolation they’re often just slipped into daily activities, such as walking, lying in bed, etc. Ten or 15 minutes a day will be helpful, but it’s worth trying to integrate a mantra into your life as much as possible, to the point where you couldn’t really time how long you’re doing it for. Thanks for sharing this mantra. This mantra is used along with a traditional Tibetan medicine Lhophel Dhutse (for either enhancing or even repairing impaired concentration and intelligence). When I searched for the Manjushri Mantra, your page was among the first links in Google and your chanting is very helpful in understanding the way to say it. I noticed that in the chanting of this mantra, the Dhiihi was sounding more like Dhihi… The Dhii should be pronounced longer as far as I could understand.